1. Tugasan ini mengandungi soalan yang disediakan dalam Bahasa Inggeris. / This assignment contains questions that is set in English. 2. Jawab dalam Bahasa Inggeris. / Answer in English. 3. Anda dikehendaki menyerahkan tugasan dalam format MsWord (.docx) melainkan dinyatakan sebaliknya. Anda tidak dibenarkan untuk menukar teks/frasa tugasan tersebut kepada format grafik seperti .jpeg / .gif / print screen / dan lain-lain format berkaitan. /Learners are to submit assignment only in MsWord(.docx) format unless specified otherwise. Please refrain from converting text/phrases into picture format such as .gif / .jpeg / print screen / etc. preparation and submission of your assignment. Your assignment should be typed using 12 point Times New Roman font and 1.5 line spacing. 5. Tugasan anda hendaklah mengandungi 3500 – 5000 patah perkataan tidak termasuk rujukan. Bilangan perkataan hendaklah ditunjukkan di hujung tugasan anda. Jangan menyalin soalan dan arahan tugasan dalam jawapan anda. Pemeriksa tidak akan membaca jawapan tugasan yang melebihi had patah perkataan yang dibenarkan. Jumlah perkataan hendaklah dinyatakan di penghujung tugasan anda. / Your assignment should be between 3500 – 5000 words excluding references. Do not copy the assignment question and instructions to your answer. Only assignment answer developed within the approximate word limit will be assessed. The number of words should be shown at the end of your assignment. 7. Anda hanya boleh menghantar tugasan SEKALI sahaja dalam SATU fail. / You can submit your assignment ONCE only in a SINGLE file. 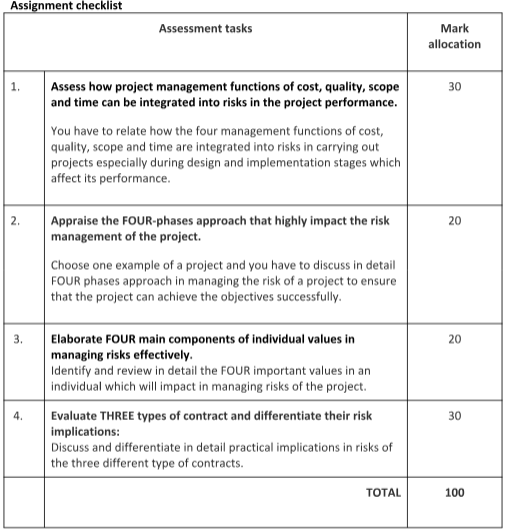 This assignment is designed to provide you with practical experience in applying project risk management concepts. You are required to provide a report based on the assessment criteria which are set out in the checklist provided. It is acceptable to use the opinions and judgments of project professionals to support your work. Knowledge about risk management is becoming a matter of paramount importance to effectively deal with the complexity of projects. The pressure for increasing quality while reducing time and costs places particular emphasis on managing risk in projects.